The Whalen Regency bookcase comes in two styles. Whalen furniture is known for a quality product that has a high performance rating. Hardwoods are used in the construction of the furniture. You can purchase many of the furniture pieces unassembled and save money. Pieces that require hinges come with European-style adjustable hinges. The slides on all of the furniture have metal ball bearings. These are just a few of the quality touches used in the furniture to ensure it lasts long and performs under everyday use. You'll find the use of the age-old technique of dovetail joints provides a genuine quality and a feeling of luxury. The special 11-step finish technique gives the bookcases a unique and rich textured look. You can locate and order any part you may need to make your assembly complete. A neat tool offered on the website is an online room builder program that allows you to layout and manipulate various pieces of furniture in several arrangements. Just enter the room dimensions, place doors and windows and then select the furniture pieces. There are two styles of bookcases in the Whalen Regency Office Furniture Collection. Both bookcases are made from solid hardwoods with cherry veneers. The beauty of this bookcase style is in part due to the finish. The cherry finish is deep and rich because it's hand-applied using a specific 11-step process. In addition to the bookcase, you can also purchase other pieces in this collection that includes an office desk with a right or left return and a side table perfect for a printer or used as an end table with a sofa or chair. 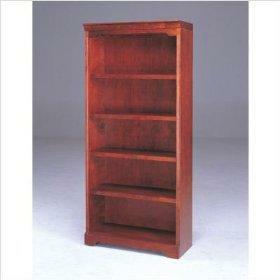 The Regency bookcase is offered either in single or double bookcase. Each type is made from the same materials and finished the same. It's excellent quality furniture that you can purchase and assemble yourself as opposed to buying already assembled. Solid hardwoods are used to make the bookcase with birch veneers that are stained in a cherry finish. The finish gives the furniture a rich texture from Whalen's 11-step finishing process. The result is a warm tone finish that you'll enjoy for many years. The Regency single bookcase is very stylish and offers a great look for your den, library or home office. It's easy to assemble and if you run into any problems, you can visit the Whalen Furniture website for a downloadable PDF how-to manual or watch a tutorial video. The bookcase has four adjustable shelves so you can customize the spacing of your shelves to accommodate your books or other items. The bookcase is 24" wide x 14.5" deep x 72" high. This versatile bookcase is 48" wide x 14.5" deep x 72" high. You can assemble it with or without the bottom double doors. If you add the double doors and later decide you want to use the bookcase without the doors, they are easy to remove. The double bookcase has a total of eight shelves with four shelves to each side. You can match the shelves to all be at the same level or adjust them with varying heights. You may have tried to find the Regency Collection in your local furniture stores or online and had a difficult time. A quick phone call to Customer Service at Whalen Furniture revealed that the Regency Collection has been discontinued. However, you may still be able to find the bookcase at one of the many Sam's Club stores. A few of the stores still have some of the pieces in stock. Another resource would be resell sites, discount and discontinued warehouses, Overstock, eBay, and even classified ad sites like Craigslist. Chances are, if you spend enough time searching online, you'll be able to find the Whalen Regency bookcase.